First day of the build, having found the workshop in single digits, I dug out the heater and some stove pipe I found on the side of the road. 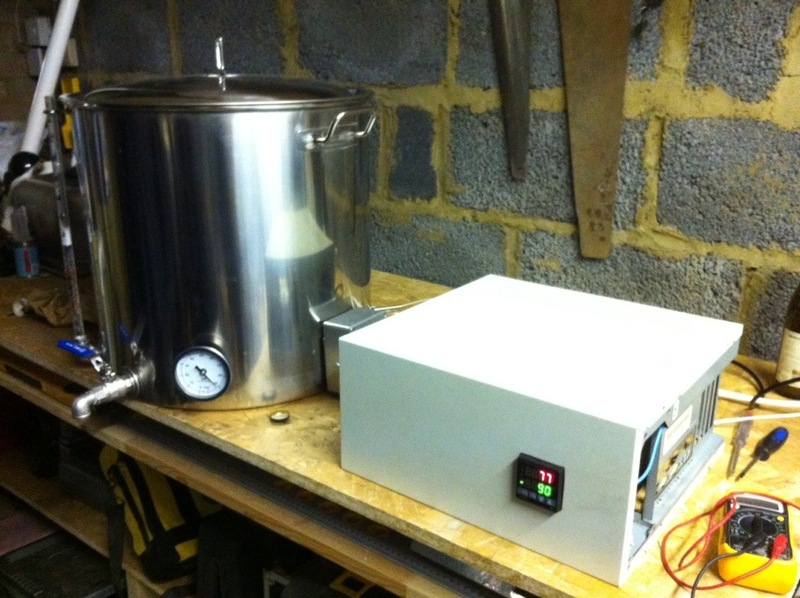 Rigged up, it took the chill out of the air… Just! Because the build costs have been more than expected, we re-purposed an old computer. 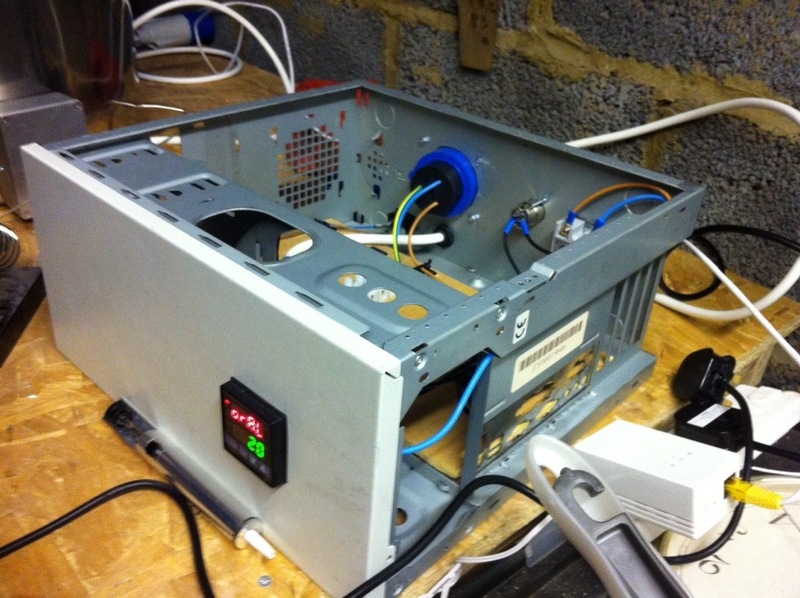 Once we’d stripped it out and given it a bit of a dust, it looked OK.
After looking at the case, we decided the best way to deal with it was to lean it over on its side. 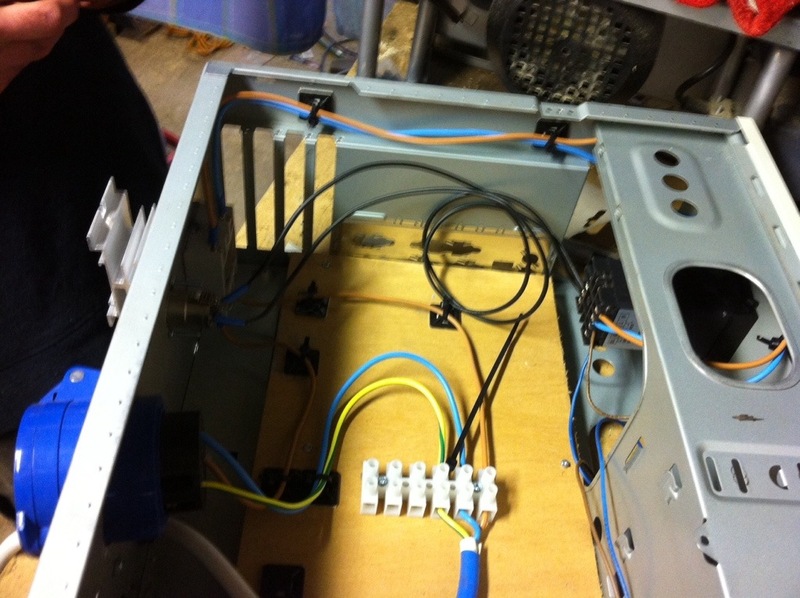 The top of it would become the panel, the back room for the plugs etc. Here’s making sure we’re all square. 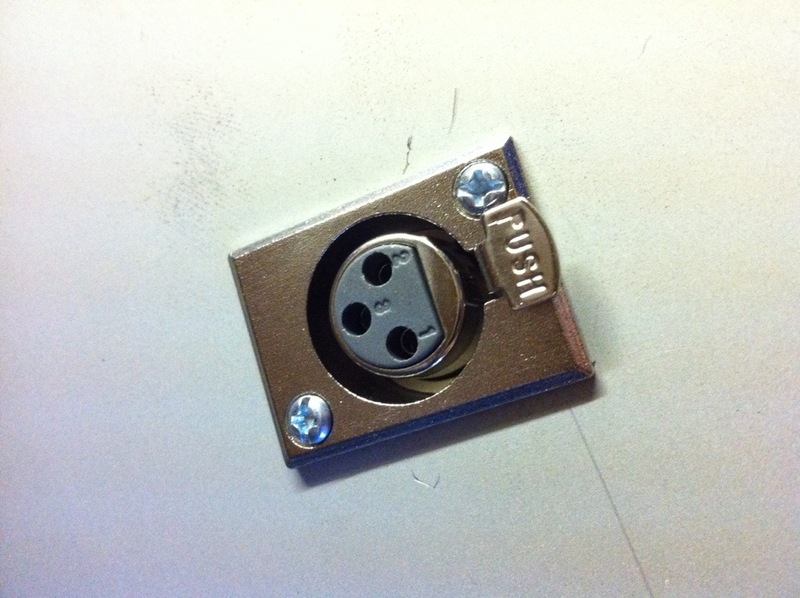 We added a 3 pin plug to make the sensor easily detachable. Sadly, it turns out that the sensor I’d ordered (a PT100) wasn’t as expected – it was a K probe. This caused a lot of confusion later on. 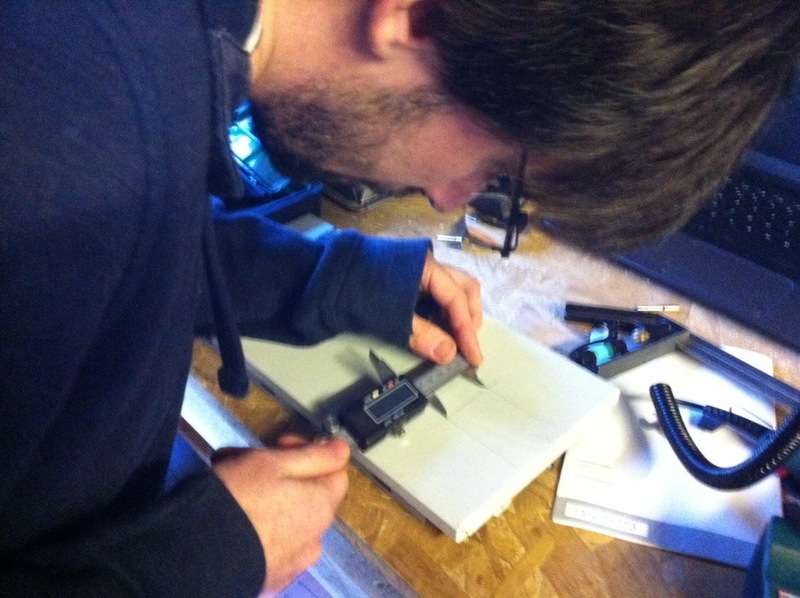 For all of the cuts, we used a dremel clone picked up from Lidl on the cheap. It was not a quick process! 3You can see the main 32 Amp socket being rounded off. 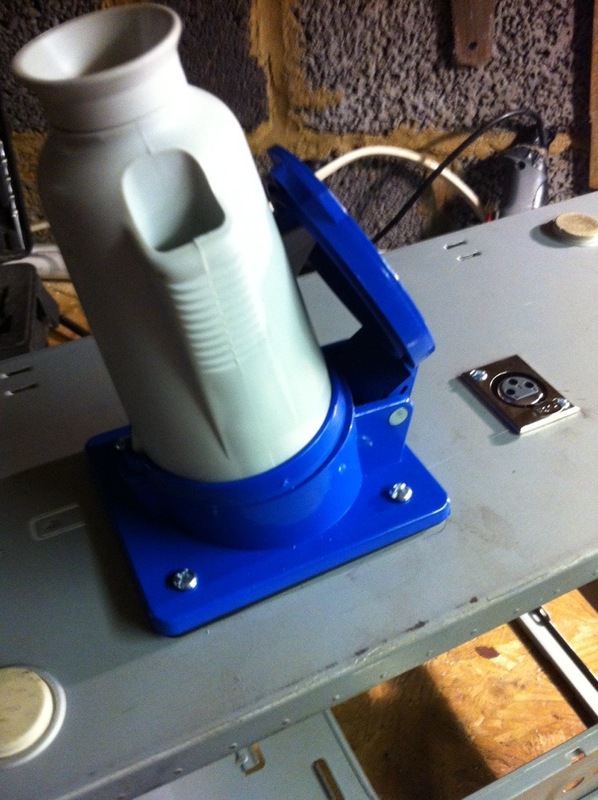 I used a chassis mount for the 32A socket. 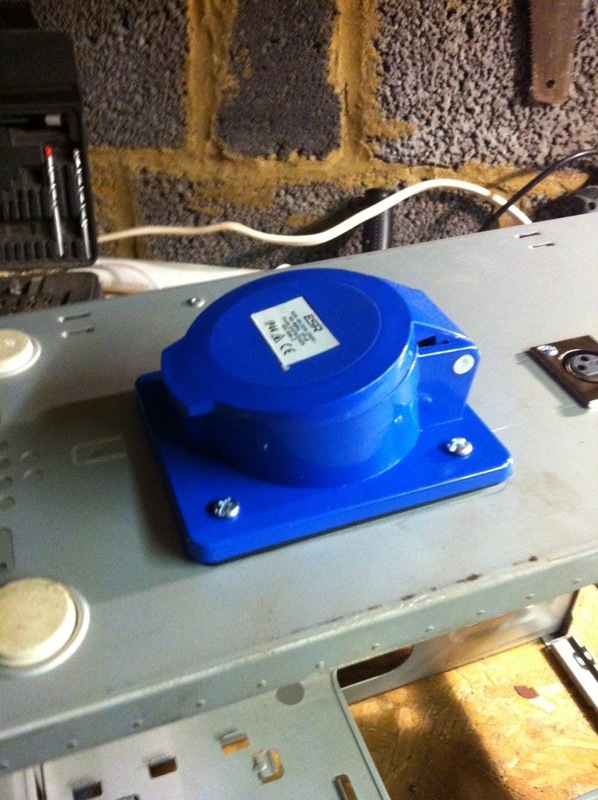 Pot box all fitted – I used an IP65 Aluminium box 2.5mm box – cost about £8 inc P&P. The thickness of the box was too much and I went down the same route many others have gone. Namely JB Weld and a stainless steel blanking plate. 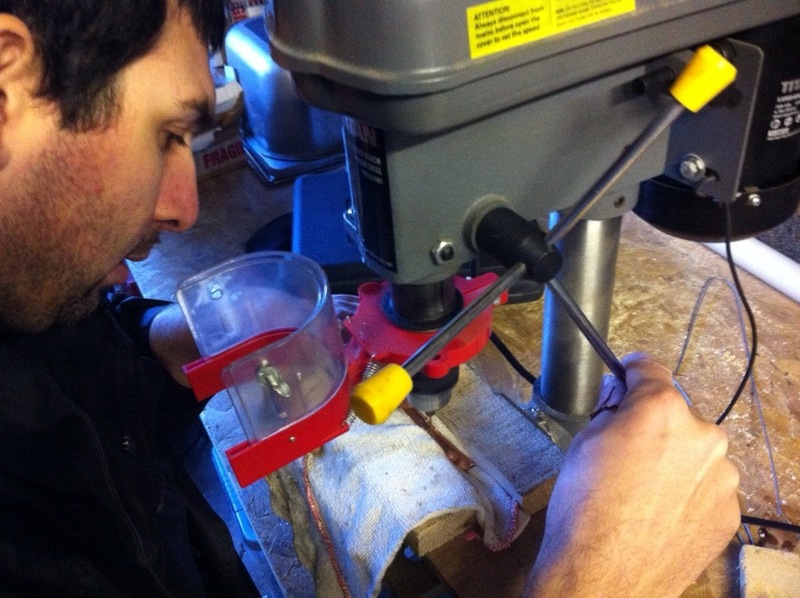 I paid over the odds – twice actually because I badly drilled the first. £5 from B&Q – just make sure you get a flat blanking plate. I hammered the two screw holes flat and JB Welded it. 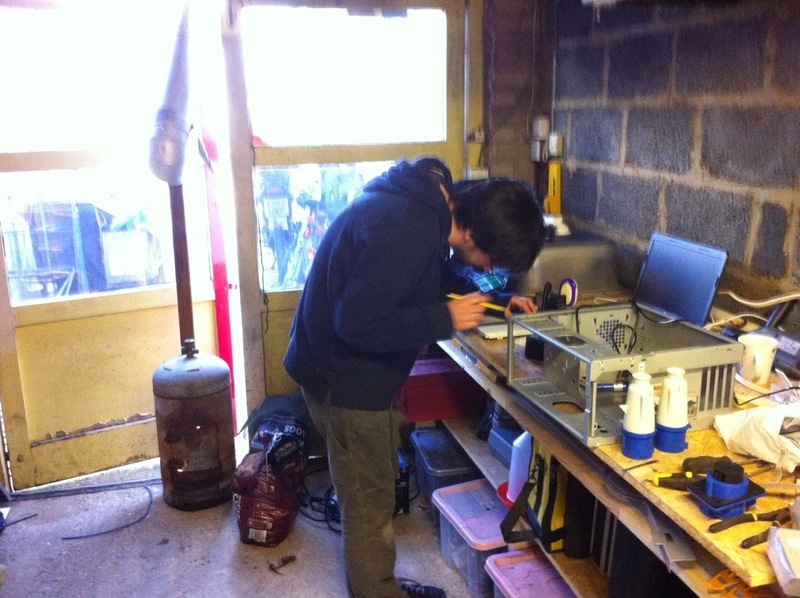 The Aluminium box had a 2.25 inch hole drilled into it and the steel plate 1.25″ hole. 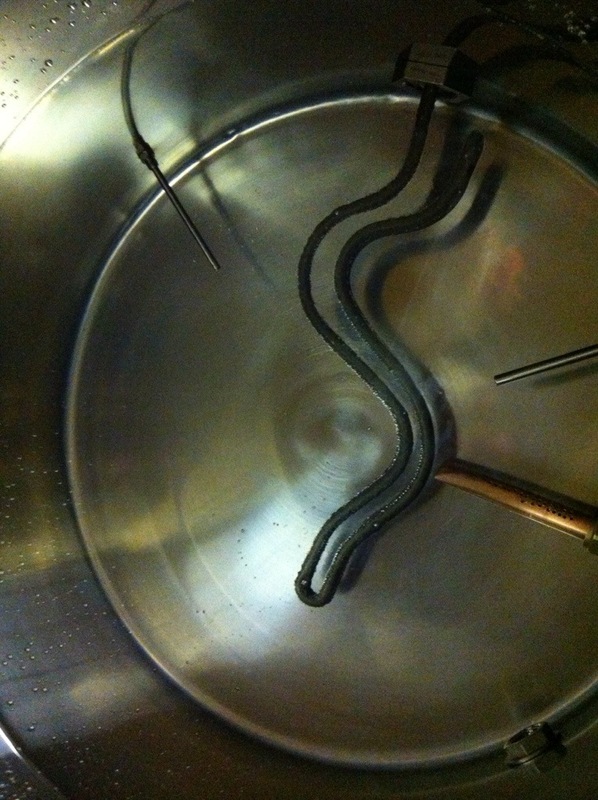 It’s held in place by the element which has been tightened by a nut on the inside of the kettle. 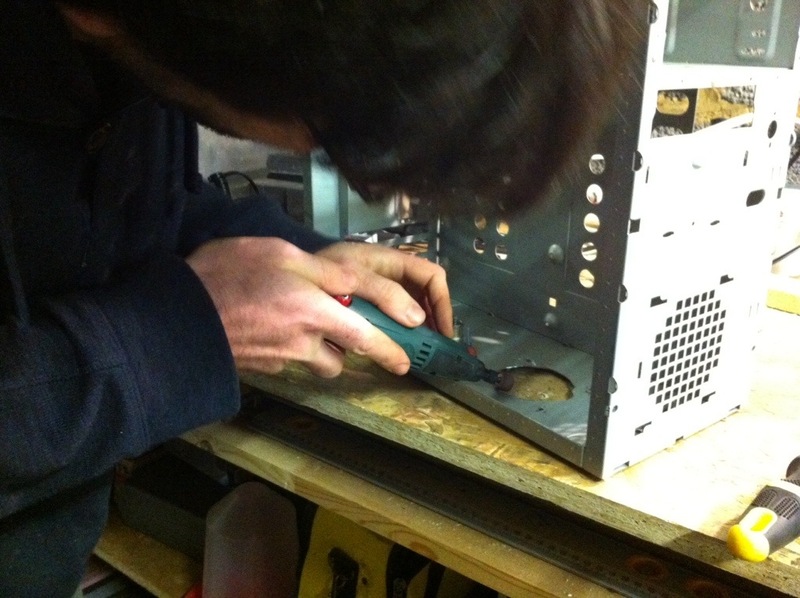 We drilled the 32A lead into the rear of the socket, put on an earth and a drain hole in the base – just in case. 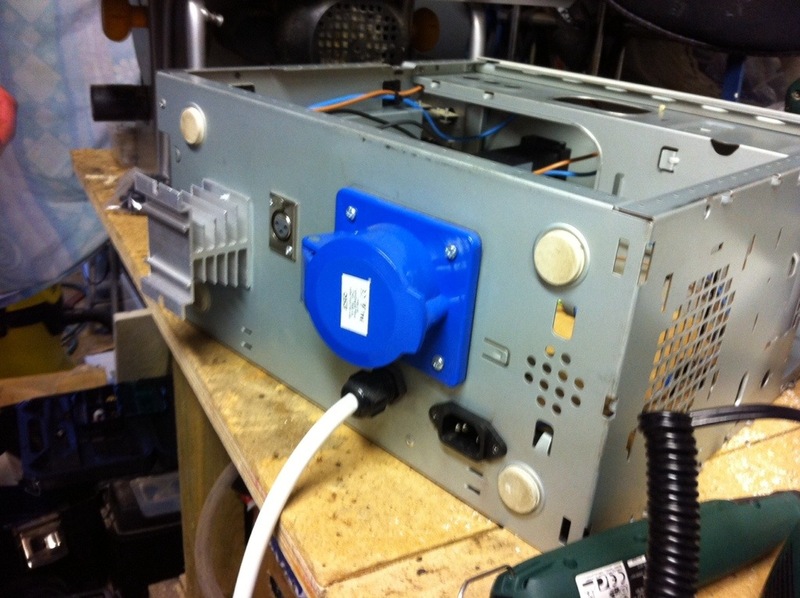 Rear of the computer case – SSR fitted with heatsink, sensor connector, 32A input and output (input is wire into grommet) and the kettle plug powers the PID separately. 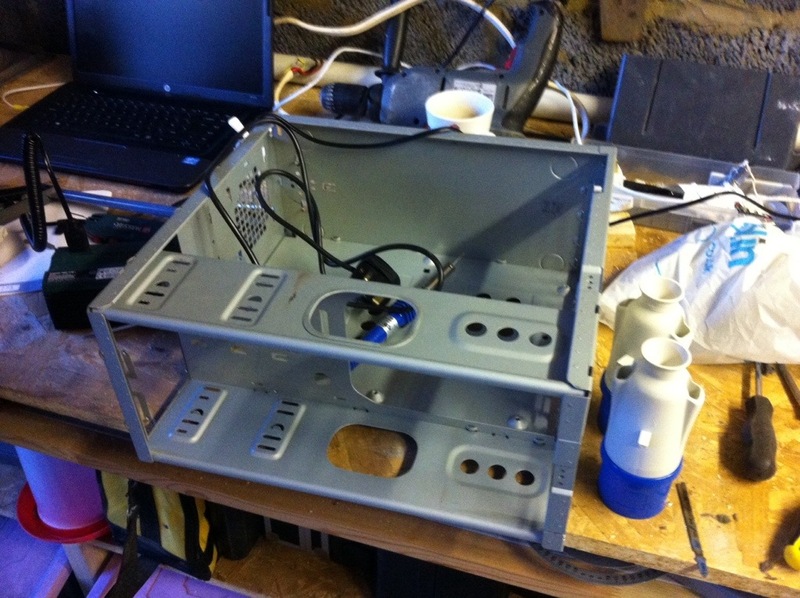 Inside is being wired up on a wooden base. Case and Pot. 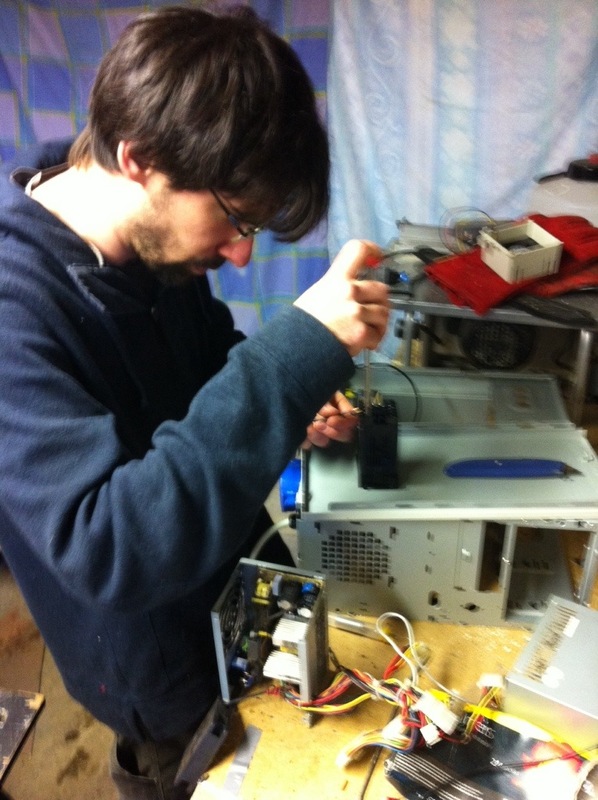 It was at this point we found problems with the PID – first we thought it was bad soldering (I’m terrible with a solder iron) – The PID was reading -360-something. Then we found it was in ‘F – a quick change to ‘C and we were -149’C. 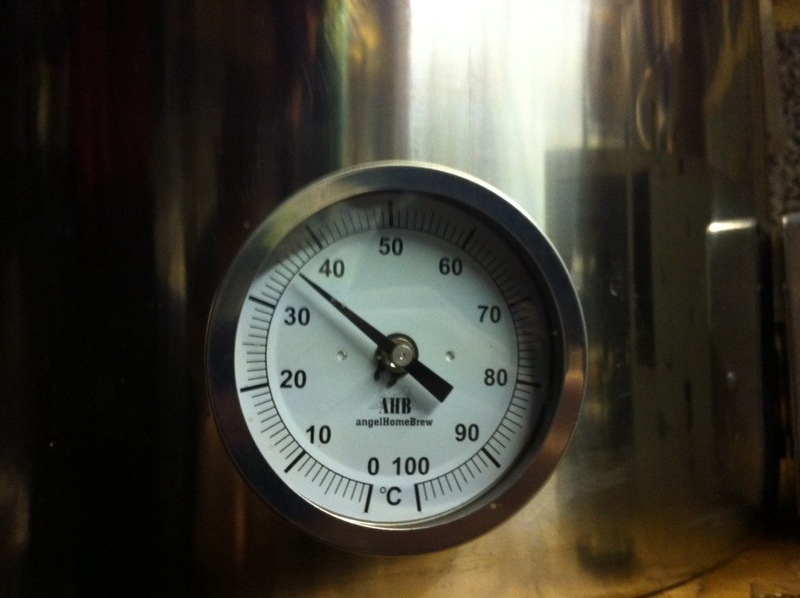 Offsets wouldn’t let us get it up to temperature (9’c). Then after checking the resistance we discovered nothing added up. I said I was concerned that the probe may not be as advertised – after checking, we realised I’d definitely been sent the wrong probe. Sigh. 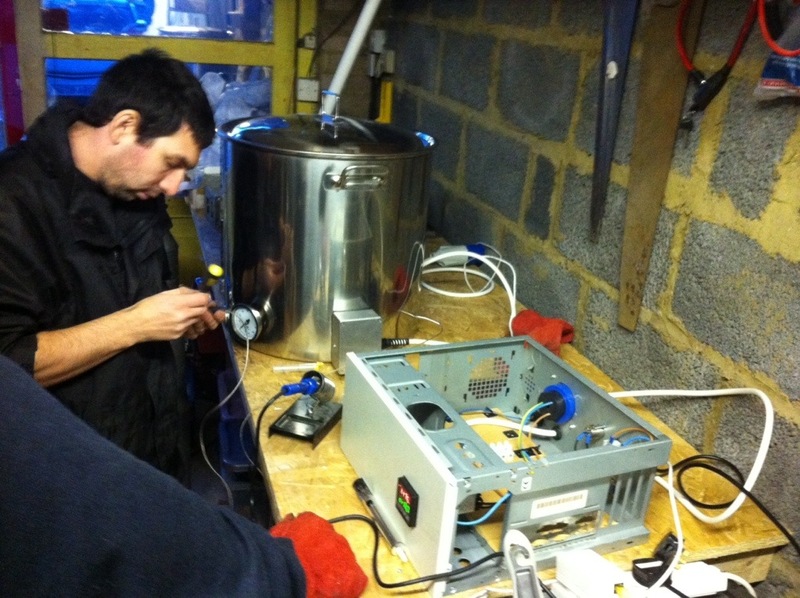 Anyway, we hooked it up and reconfigured the PID. The K-Probe really didn’t do a great job. Either that or water now boils at 80’C at sea level. Element switched on! Look, bubbles! 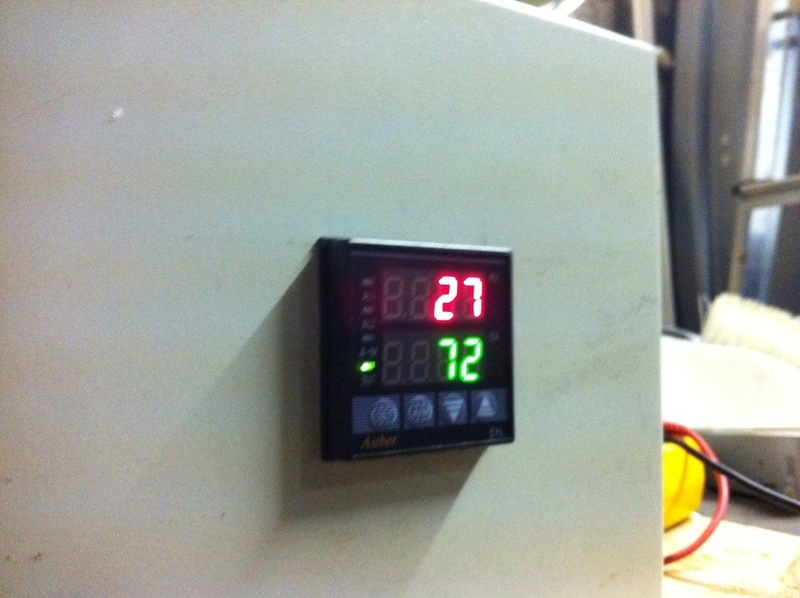 And the PID, 27’C – by the time we were boiling, the overall temperature differential was 15’C. A fair difference when you’re trying to hit a temperature of 72’C. Not far off a boil! 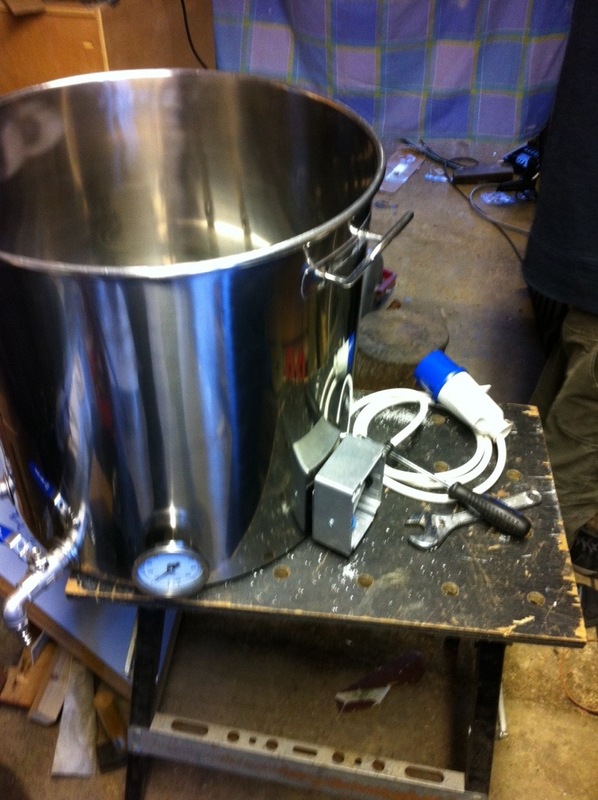 Ready now for the first brew!